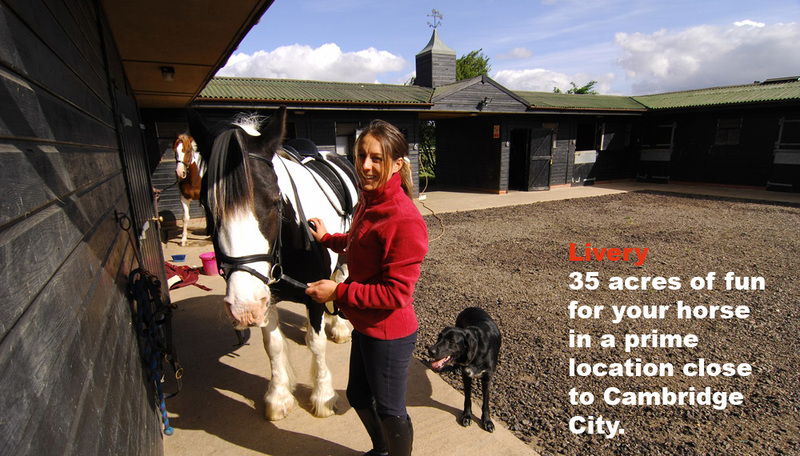 We offer full and part livery as part of Waterbeach Stud ltd, all horses live out but can live in. All our gateways and walkways are hard standing and all our fields are fenced safely with posts and rails or posts and electric fences. We are very lucky to have a so much good pasture which enables us to offer grazing throughout the year, with very little mud in the winter! Most of our horses live out all year round and are very happy and relaxed, even the competition horses, as they love being outside and playing in their herds. This has the additional benefit of keeping livery costs down. Although we have extensive grazing, we restrict the total number of horses living out so as to enable good pasture management. This is important for the health of all the horses on the yard. If your preference is for your horse to live in, we also have six boxes ranging from 10ft x 12ft to 12ft x 16ft; all with rubber matting. All new horses are subject to blood tests/swabs and worm counts. With 2 weeks in quarantine, before they are brought in to contact with other horses on the yard. Thus you can be confident that your horse is living in a healthy environment. All livery customers get a discount on lessons and access to our floodlit, 20 x 40 meter, all-weather, outdoor arena. Should you and your horse have any specific requirements, such as schooling, clipping, competition preparation, these can be discussed.